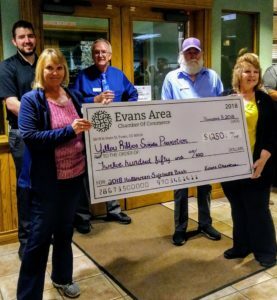 The Evans Area Chamber of Commerce was able to donate $1250 to Yellow Ribbon Suicide Prevention – Greeley, CO Chapter from our Halloween Benefit Softball Tournament held on October 27th. Special Thanks to our Sponsors Signs First Greeley, City of Evans, and Bank of Colorado for making this possible. Thank you to everyone who came out to play! We feel so privileged to be able to give back to the community and our Non-profits!